Although not as exciting as the week before, last week we did see some 'interesting' IEM being released. First, of course, is the lower priced dual drives IEM from Apple. Most of the current dual drivers in the market are priced over US$100 (generally in the region of US$150), which means Apple's IEM already on a good start by giving more bang for the bucks. The real question is of course how well it will sound. After all, an IEM value is set by its sound quality, not by the number of transducer. Another interesting observation is this IEM comes with a mic (on its in-line control), yet it is not compatible with iPhone (as Apple claimed). So the mic is for iPod only? Weird! Beside the low price, the most noticeable feature on Apple's IEM is the removable metal mesh on the nozzle. Most IEM with metal mesh have no easy way for cleaning up in the case of earwax clogging, Apple's new design might be the answer for those who don't take time cleaning their ears and their 'phone. Second IEM in my list of most interesting IEM of the week is Dr. Dre's Monster's Beats Tour IEM. I am not much of a MonsterCable fan (or any expensive cable in the matter) and certainly not feeling fond to the idea of marketing headphone by celebrity association - Getting a good sound is what its counts. Putting someone's name on the packaging wouldn't make a headphone sounds any better. What really interested me about this IEM is the ribbon style cable. If it works as Monster's advertised, than perhaps there is something good in this IEM to look forward to. 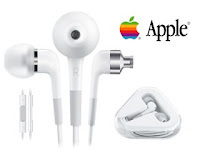 Apple In-Ear Headphones with Remote and Mic, the first balanced armature based headphone from Apple. It has dual transducer on each side in a two-ways configuration. It comes with an in-line controller and mic but not compatible with iPhone... go figure. MSRP US$79. 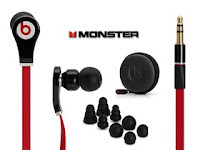 Monster Beats by Dr. Dre Tour In-Ear Headphone, the second headphone in the Beats by Dr. Dre series from Monster, the company that is famous for its MonsterCable brand. There isn't any detail spec on this IEM. Consider it is made by Monster and bearing the name of Dr. Dre, do you really need to know the spec? MSRP US$150.